With technology becoming more prominent in my children's lives, I am drawn toward literature that informs me and empowers me as a parent since I sometimes feel helpless as I witness how quickly my kids are becoming familiar with the Internet, social media, and any gadget that is placed in their still small hands. 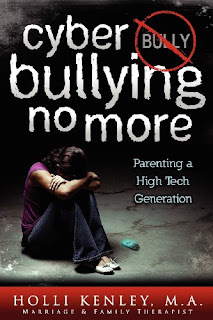 Cyber Bullying No More is a concise, but highly informative book on wise strategies to help parents deal with a reality they wish would go away—cyber bullying. This simple, yet well-thought out book covers three areas of importance: protection, intervention and prevention. 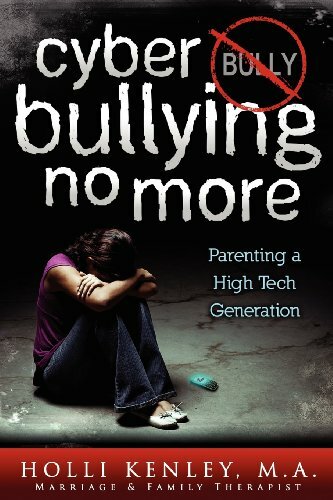 The best advice I got out of this book is the amount and quality of communication and supervision that is required from parents when parenting their emotionally young but tech-savvy kids. The principles and daily practices the author expounds are intelligent and they make sense. Her experience as a marriage and family therapist comes through as she takes an international problem and shows families they can deal with it. All parents should be informed and armed to help their kids in the best possible way and this book does that. Initially, I thought there couldn't be enough information in this publication that looks more like a pamphlet than a book, but after I read it I can see that it's enough information to assist parents substantially without overwhelming them. Yes, technology is advancing at such a rapid pace many parents feel left behind, but this book can help you to see that you are the parent and your authoritative but loving parenting is paramount. If bullying has become more of a concern for you, the author also includes a bibliography of books for additional reading. I think this book is beneficial for parents with children of all ages, especially 5 and over. Prevention is the best medicine. It's never too early or too late to start. This book is for those parents who want to get on the bandwagon of a parental movement to guide, monitor and balance their children' intake of the needed yet dangerous world of technology. To learn more about Holli Kenley's books, please visit her at www.hollikenley.com. As an Information Technology (IT) professional, a concerned father, and a childhood victim of sexual predators, Travis Morgan felt the need to write a book as guide for parents and others—particularly those who need help to break dangerous computer habits—about what he calls “computer forensics”. Right from the onset, I liked Morgan's friendly voice and his sense of humour as he deals with a heavy topic. This book is easy and quick to read with large font and plenty of screenshots to illustrate what your computer screen would look like as you apply his suggestions for search techniques. Morgan goes on to explain the basics (web browsing, emails, social media, browsing history) and the more complicated (web logs, peer to peer software and Key Loggers). There was a lot of info I already knew, but also a lot I didn't know. And I realized as I read this book that our kids will figure it all out in no time! This book will serve as a guide and manual as I strive to become a better informed parent and learn more about the technology that will become more prominent in my children's lives. I've learned to decipher what may seem complicated about a computer and how to implement simple strategies such as how to block inappropriate sites, and how to program time limits of computer usage. Morgan has made me realize it's not so complicated. I smiled every time I saw the 2-page spread comic illustration that introduces every chapter. Morgan's experience as a father with three children is clear as he doles out his advice. He encourages parents to get to know the digital lingo and use it with their kids. As the title implies, this book can help a parent or a spouse discover what their children or spouse is doing on the Internet. The author does warn that it's best to use open communication and to be aware of laws restricting you from breach of privacy of the other party. I also think that what is truly important is what we do when we do discover some illegal activity. Accusations can fly and destroy relationships especially if the information is not what it seems. Children can stumble on bad sites without having to go look for them. The author speaks of this as well. 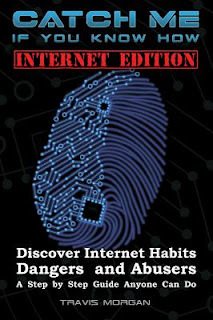 Overall, this is a use-friendly book to better understand how to do research and monitoring on your computer with the ultimate goal of protecting your family. I'm so glad I read it. It is a sobering reminder of how dangerous the Internet can be and how I can do something about it as a parent. The author also offers additional information on his website: www.catchmeifyouknowhow.com. Disclosure: Thanks to the authors and publishers for sending me these book for review. I was not compensated in any other way, nor told how to rate or review this product.